An atomic nucleus is formed by a number of protons, Z (the atomic number), and a number of neutrons, N (the neutron number), bound together by the nuclear force. The atomic number defines the chemical properties of the atom, and the neutron number determines the isotope or nuclide. The terms isotope and nuclide are often used synonymously, but they refer to chemical and nuclear properties, respectively. Strictly speaking, isotopes are two or more nuclides with the same number of protons; nuclides with the same number of neutrons are called isotones. The atomic mass number, symbol A, equals Z+N. Nuclides with the same atomic mass number are called isobars. 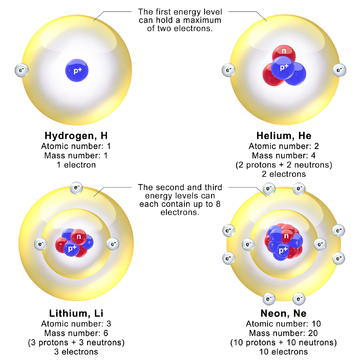 The nucleus of the most common isotope of the hydrogen atom (with the chemical symbol 1H) is a lone proton. The nuclei of the heavy hydrogen isotopes deuterium (D or 2H) and tritium (T or 3H) contain one proton bound to one and two neutrons, respectively. All other types of atomic nuclei are composed of two or more protons and various numbers of neutrons. The most common nuclide of the common chemical element lead, 208Pb, has 82 protons and 126 neutrons, for example. The table of nuclides comprises all the known nuclides. Even though it is not a chemical element, the neutron is included in this table. Protons and neutrons behave almost identically under the influence of the nuclear force within the nucleus. The concept of isospin, in which the proton and neutron are viewed as two quantum states of the same particle, is used to model the interactions of nucleons by the nuclear or weak forces. Because of the strength of the nuclear force at short distances, the binding energy of nucleons is more than seven orders of magnitude larger than the electromagnetic energy binding electrons in atoms. Nuclear reactions (such as nuclear fission) therefore have an energy density that is more than ten million times that of chemical reactions. Because of the mass–energy equivalence, nuclear binding energies reduce the mass of nuclei. Ultimately, the ability of the nuclear force to store energy arising from the electromagnetic repulsion of nuclear components is the basis for most of the energy that makes nuclear reactors or bombs possible. 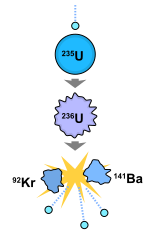 In nuclear fission, the absorption of a neutron by a heavy nuclide (e.g., uranium-235) causes the nuclide to become unstable and break into light nuclides and additional neutrons. The positively charged light nuclides then repel, releasing electromagnetic potential energy. Throughout the 1920s, physicists assumed that the atomic nucleus was composed of protons and "nuclear electrons" but there were obvious problems. It was difficult to reconcile the proton–electron model for nuclei with the Heisenberg uncertainty relation of quantum mechanics. The Klein paradox, discovered by Oskar Klein in 1928, presented further quantum mechanical objections to the notion of an electron confined within a nucleus. Observed properties of atoms and molecules were inconsistent with the nuclear spin expected from the proton–electron hypothesis. Both protons and electrons carry an intrinsic spin of ½ ħ. Isotopes of the same species (i.e having the same number of protons) can have both integer or fractional spin, i.e. the neutron spin must be also fractional (½ ħ). However, there is no way to arrange the spins of an electron and a proton (supposed to bond to form a neutron) to get the fractional spin of a neutron. In 1931, Walther Bothe and Herbert Becker found that if alpha particle radiation from polonium fell on beryllium, boron, or lithium, an unusually penetrating radiation was produced. The radiation was not influenced by an electric field, so Bothe and Becker assumed it was gamma radiation. The following year Irène Joliot-Curie and Frédéric Joliot-Curie in Paris showed that if this "gamma" radiation fell on paraffin, or any other hydrogen-containing compound, it ejected protons of very high energy. Neither Rutherford nor James Chadwick at the Cavendish Laboratory in Cambridge were convinced by the gamma ray interpretation. Chadwick quickly performed a series of experiments that showed that the new radiation consisted of uncharged particles with about the same mass as the proton. These particles were neutrons. Chadwick won the 1935 Nobel Prize in Physics for this discovery.
) of the deuteron (about 0.06% of the total energy). Even though the neutron is a neutral particle, the magnetic moment of a neutron is not zero. The neutron is not affected by electric fields, but it is affected by magnetic fields. The magnetic moment of the neutron is an indication of its quark substructure and internal charge distribution. The value for the neutron's magnetic moment was first directly measured by Luis Alvarez and Felix Bloch at Berkeley, California, in 1940. Alvarez and Bloch determined the magnetic moment of the neutron to be μn= 2999807000000000000♠−1.93(2) μN, where μN is the nuclear magneton. In one of the early successes of the Standard Model (SU(6) theory, now understood in terms of quark behavior), in 1964 Mirza A.B. Beg, Benjamin W. Lee, and Abraham Pais theoretically calculated the ratio of proton to neutron magnetic moments to be −3/2, which agrees with the experimental value to within 3%. The measured value for this ratio is 2999854010195000000♠−1.45989805(34). A contradiction of the quantum mechanical basis of this calculation with the Pauli exclusion principle, led to the discovery of the color charge for quarks by Oscar W. Greenberg in 1964. The neutron magnetic moment can be roughly computed by assuming a simple nonrelativistic, quantum mechanical wavefunction for baryons composed of three quarks. A straightforward calculation gives fairly accurate estimates for the magnetic moments of neutrons, protons, and other baryons. 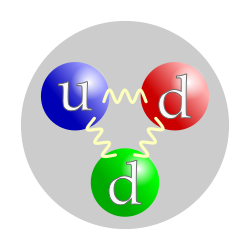 For a neutron, the end result of this calculation is that the magnetic moment of the neutron is given by μn= 4/3 μd − 1/3 μu, where μd and μu are the magnetic moments for the down and up quarks, respectively. This result combines the intrinsic magnetic moments of the quarks with their orbital magnetic moments, and assumes the three quarks are in a particular, dominant quantum state. The antineutron is the antiparticle of the neutron. It was discovered by Bruce Cork in 1956, a year after the antiproton was discovered. CPT-symmetry puts strong constraints on the relative properties of particles and antiparticles, so studying antineutrons provides stringent tests on CPT-symmetry. The fractional difference in the masses of the neutron and antineutron is 6995900000000000000♠(9±6)×10−5. Since the difference is only about two standard deviations away from zero, this does not give any convincing evidence of CPT-violation. Fast neutron therapy utilizes high-energy neutrons typically greater than 20 MeV to treat cancer. Radiation therapy of cancers is based upon the biological response of cells to ionizing radiation. If radiation is delivered in small sessions to damage cancerous areas, normal tissue will have time to repair itself, while tumor cells often cannot. Neutron radiation can deliver energy to a cancerous region at a rate an order of magnitude larger than gamma radiation. Hydrogen-rich ordinary water affects neutron absorption in nuclear fission reactors: Usually, neutrons are so strongly absorbed by normal water that fuel enrichment with fissionable isotope is required. [clarification needed] The deuterium in heavy water has a very much lower absorption affinity for neutrons than does protium (normal light hydrogen). 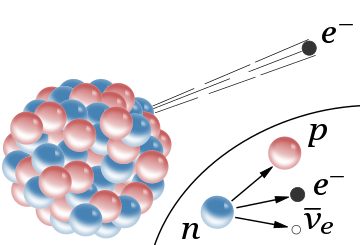 Deuterium is, therefore, used in CANDU-type reactors, in order to slow (moderate) neutron velocity, to increase the probability of nuclear fission compared to neutron capture. Thermal neutrons are free neutrons whose energies have a Maxwell–Boltzmann distribution with kT= 6979405350651211000♠0.0253 eV (6979399999999999999♠4.0×10−21 J) at room temperature. This gives characteristic (not average, or median) speed of 2.2 km/s. The name 'thermal' comes from their energy being that of the room temperature gas or material they are permeating. (see kinetic theory for energies and speeds of molecules). 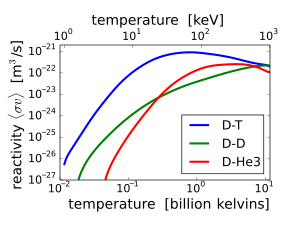 After a number of collisions (often in the range of 10–20) with nuclei, neutrons arrive at this energy level, provided that they are not absorbed. In many substances, thermal neutron reactions show a much larger effective cross-section than reactions involving faster neutrons, and thermal neutrons can therefore be absorbed more readily (i.e., with higher probability) by any atomic nuclei that they collide with, creating a heavier – and often unstable – isotope of the chemical element as a result. Wikimedia Commons has media related to Neutrons. ^ Ernest Rutherford. Chemed.chem.purdue.edu. Retrieved on 2012-08-16. ^ a b 1935 Nobel Prize in Physics. Nobelprize.org. Retrieved on 2012-08-16. ^ a b c d e f g h Mohr, P.J. ; Taylor, B.N. and Newell, D.B. (2014), "The 2014 CODATA Recommended Values of the Fundamental Physical Constants" (Web Version 7.0). The database was developed by J. Baker, M. Douma, and S. Kotochigova. (2014). National Institute of Standards and Technology, Gaithersburg, Maryland 20899. ^ a b Olive, K.A. ; (Particle Data Group); et al. (2014). "Review of Particle Physics" (PDF). Chinese Physics C. 38 (9): 090001. Bibcode:2014ChPhC..38i0001O. doi:10.1088/1674-1137/38/9/090001. ^ a b Chadwick, James (1932). "Possible Existence of a Neutron". Nature. 129 (3252): 312. Bibcode:1932Natur.129Q.312C. doi:10.1038/129312a0. ^ Hahn, O. & Strassmann, F. (1939). "Über den Nachweis und das Verhalten der bei der Bestrahlung des Urans mittels Neutronen entstehenden Erdalkalimetalle" [On the detection and characteristics of the alkaline earth metals formed by irradiation of uranium with neutrons]. Die Naturwissenschaften. 27 (1): 11–15. Bibcode:1939NW.....27...11H. doi:10.1007/BF01488241. ^ a b Carson, M.J.; et al. (2004). "Neutron background in large-scale xenon detectors for dark matter searches". Astroparticle Physics. 21 (6): 667–687. arXiv:hep-ex/0404042. Bibcode:2004APh....21..667C. doi:10.1016/j.astropartphys.2004.05.001. ^ Nudat 2. Nndc.bnl.gov. Retrieved on 2010-12-04. ^ Povh, B.; Rith, K.; Scholz, C.; Zetsche, F. (2002). Particles and Nuclei: An Introduction to the Physical Concepts. Berlin: Springer-Verlag. p. 73. ISBN 978-3-540-43823-6. ^ Basdevant, J.-L.; Rich, J.; Spiro, M. (2005). Fundamentals in Nuclear Physics. Springer. p. 155. ISBN 978-0-387-01672-6. ^ Tipler, Paul Allen; Llewellyn, Ralph A. (2002). Modern Physics (4 ed.). Macmillan. p. 310. ISBN 978-0-7167-4345-3. ^ a b c Nakamura, K (2010). "Review of Particle Physics". Journal of Physics G. 37 (7A): 075021. Bibcode:2010JPhG...37g5021N. doi:10.1088/0954-3899/37/7A/075021. PDF with 2011 partial update for the 2012 edition The exact value of the mean lifetime is still uncertain, due to conflicting results from experiments. The Particle Data Group reports values up to six seconds apart (more than four standard deviations), commenting that "our 2006, 2008, and 2010 Reviews stayed with 885.7±0.8 s; but we noted that in light of SEREBROV 05 our value should be regarded as suspect until further experiments clarified matters. Since our 2010 Review, PICHLMAIER 10 has obtained a mean life of 880.7±1.8 s, closer to the value of SEREBROV 05 than to our average. And SEREBROV 10B[...] claims their values should be lowered by about 6 s, which would bring them into line with the two lower values. However, those reevaluations have not received an enthusiastic response from the experimenters in question; and in any case the Particle Data Group would have to await published changes (by those experimenters) of published values. At this point, we can think of nothing better to do than to average the seven best but discordant measurements, getting 881.5±1.5s. Note that the error includes a scale factor of 2.7. This is a jump of 4.2 old (and 2.8 new) standard deviations. This state of affairs is a particularly unhappy one, because the value is so important. We again call upon the experimenters to clear this up." ^ Adair, R.K. (1989). The Great Design: Particles, Fields, and Creation. Oxford University Press. p. 214. Bibcode:1988gdpf.book.....A. ^ Cottingham, W.N. ; Greenwood, D.A. (1986). An Introduction to Nuclear Physics. Cambridge University Press. ISBN 9780521657334. ^ a b Rutherford, E. (1920). "Nuclear Constitution of Atoms". Proceedings of the Royal Society A. 97 (686): 374–400. Bibcode:1920RSPSA..97..374R. doi:10.1098/rspa.1920.0040. ^ Pauli, Wolfgang; Hermann, A.; Meyenn, K.v; Weisskopff, V.F (1985). "Das Jahr 1932 Die Entdeckung des Neutrons". Wolfgang Pauli. Sources in the History of Mathematics and Physical Sciences. 6. pp. 105–144. doi:10.1007/978-3-540-78801-0_3. ISBN 978-3-540-13609-5. ^ Hendry, John, ed. (1984). Cambridge Physics in the Thirties. Bristol: Adam Hilger. ISBN 978-0852747612. ^ Feather, N. (1960). "A history of neutrons and nuclei. Part 1". Contemporary Physics. 1 (3): 191–203. Bibcode:1960ConPh...1..191F. doi:10.1080/00107516008202611. ^ Brown, Laurie M. (1978). "The idea of the neutrino". Physics Today. 31 (9): 23–28. Bibcode:1978PhT....31i..23B. doi:10.1063/1.2995181. ^ a b Stuewer, Roger H. (1985). "Niels Bohr and Nuclear Physics". In French, A.P. ; Kennedy, P.J. (eds.). Niels Bohr: A Centenary Volume. Harvard University Press. pp. 197–220. ISBN 978-0674624160. ^ Pais, Abraham (1986). Inward Bound. Oxford: Oxford University Press. p. 299. ISBN 978-0198519973. ^ Klein, O. (1929). "Die Reflexion von Elektronen an einem Potentialsprung nach der relativistischen Dynamik von Dirac". Zeitschrift für Physik. 53 (3–4): 157–165. Bibcode:1929ZPhy...53..157K. doi:10.1007/BF01339716. ^ Bothe, W.; Becker, H. (1930). "Künstliche Erregung von Kern-γ-Strahlen" [Artificial excitation of nuclear γ-radiation]. Zeitschrift für Physik. 66 (5–6): 289–306. Bibcode:1930ZPhy...66..289B. doi:10.1007/BF01390908. ^ Becker, H.; Bothe, W. (1932). "Die in Bor und Beryllium erregten γ-Strahlen" [Γ-rays excited in boron and beryllium]. Zeitschrift für Physik. 76 (7–8): 421–438. Bibcode:1932ZPhy...76..421B. doi:10.1007/BF01336726. ^ Joliot-Curie, Irène & Joliot, Frédéric (1932). "Émission de protons de grande vitesse par les substances hydrogénées sous l'influence des rayons γ très pénétrants" [Emission of high-speed protons by hydrogenated substances under the influence of very penetrating γ-rays]. Comptes Rendus. 194: 273. ^ Brown, Andrew (1997). The Neutron and the Bomb: A Biography of Sir James Chadwick. Oxford University Press. ISBN 978-0-19-853992-6. ^ "Atop the Physics Wave: Rutherford Back in Cambridge, 1919–1937". Rutherford's Nuclear World. American Institute of Physics. 2011–2014. Retrieved 19 August 2014. ^ Chadwick, J. (1933). "Bakerian Lecture. The Neutron". Proceedings of the Royal Society A. 142 (846): 1–25. Bibcode:1933RSPSA.142....1C. doi:10.1098/rspa.1933.0152. ^ Heisenberg, W. (1932). "Über den Bau der Atomkerne. I". Zeitschrift für Physik. 77 (1–2): 1–11. Bibcode:1932ZPhy...77....1H. doi:10.1007/BF01342433. ^ Heisenberg, W. (1932). "Über den Bau der Atomkerne. II". Zeitschrift für Physik. 78 (3–4): 156–164. Bibcode:1932ZPhy...78..156H. doi:10.1007/BF01337585. ^ Heisenberg, W. (1933). "Über den Bau der Atomkerne. III". Zeitschrift für Physik. 80 (9–10): 587–596. Bibcode:1933ZPhy...80..587H. doi:10.1007/BF01335696. ^ Iwanenko, D. (1932). "The Neutron Hypothesis". Nature. 129 (3265): 798. Bibcode:1932Natur.129..798I. doi:10.1038/129798d0. ^ Miller A.I. (1995) Early Quantum Electrodynamics: A Sourcebook, Cambridge University Press, Cambridge, ISBN 0521568919, pp. 84–88. ^ Wilson, Fred L. (1968). "Fermi's Theory of Beta Decay". American Journal of Physics. 36 (12): 1150–1160. Bibcode:1968AmJPh..36.1150W. doi:10.1119/1.1974382. ^ Chadwick, J.; Goldhaber, M. (1934). "A nuclear photo-effect: disintegration of the diplon by gamma rays". Nature. 134 (3381): 237–238. Bibcode:1934Natur.134..237C. doi:10.1038/134237a0. ^ Chadwick, J.; Goldhaber, M. (1935). "A nuclear photoelectric effect". Proceedings of the Royal Society of London A. 151 (873): 479–493. Bibcode:1935RSPSA.151..479C. doi:10.1098/rspa.1935.0162. ^ Cooper, Dan (1999). Enrico Fermi: And the Revolutions in Modern physics. New York: Oxford University Press. ISBN 978-0-19-511762-2. OCLC 39508200. ^ Hahn, O. (1958). "The Discovery of Fission". Scientific American. 198 (2): 76–84. Bibcode:1958SciAm.198b..76H. doi:10.1038/scientificamerican0258-76. ^ Rife, Patricia (1999). Lise Meitner and the dawn of the nuclear age. Basel, Switzerland: Birkhäuser. ISBN 978-0-8176-3732-3. ^ Hahn, O.; Strassmann, F. (10 February 1939). "Proof of the Formation of Active Isotopes of Barium from Uranium and Thorium Irradiated with Neutrons; Proof of the Existence of More Active Fragments Produced by Uranium Fission". Die Naturwissenschaften. 27 (6): 89–95. Bibcode:1939NW.....27...89H. doi:10.1007/BF01488988. ^ "The Nobel Prize in Chemistry 1944". Nobel Foundation. Retrieved 2007-12-17. ^ Bernstein, Jeremy (2001). Hitler's uranium club: the secret recordings at Farm Hall. New York: Copernicus. p. 281. ISBN 978-0-387-95089-1. ^ "The Nobel Prize in Chemistry 1944: Presentation Speech". Nobel Foundation. Retrieved 2008-01-03. ^ Sir James Chadwick’s Discovery of Neutrons. ANS Nuclear Cafe. Retrieved on 2012-08-16. ^ Particle Data Group Summary Data Table on Baryons. lbl.gov (2007). Retrieved on 2012-08-16. ^ Greene, GL; et al. (1986). "New determination of the deuteron binding energy and the neutron mass". Physical Review Letters. 56 (8): 819–822. Bibcode:1986PhRvL..56..819G. doi:10.1103/PhysRevLett.56.819. PMID 10033294. ^ a b Gell, Y.; Lichtenberg, D.B. (1969). "Quark model and the magnetic moments of proton and neutron". Il Nuovo Cimento A. Series 10. 61 (1): 27–40. Bibcode:1969NCimA..61...27G. doi:10.1007/BF02760010. ^ Alvarez, L.W; Bloch, F. (1940). "A quantitative determination of the neutron magnetic moment in absolute nuclear magnetons". Physical Review. 57 (2): 111–122. Bibcode:1940PhRv...57..111A. doi:10.1103/physrev.57.111. ^ a b c Perkins, Donald H. (1982). Introduction to High Energy Physics. Addison Wesley, Reading, Massachusetts. pp. 201–202. ISBN 978-0-201-05757-7. ^ Beg, M.A.B. ; Lee, B.W. ; Pais, A. (1964). "SU(6) and electromagnetic interactions". Physical Review Letters. 13 (16): 514–517, erratum 650. Bibcode:1964PhRvL..13..514B. doi:10.1103/physrevlett.13.514. ^ Sakita, B. (1964). "Electromagnetic properties of baryons in the supermultiplet scheme of elementary particles". Physical Review Letters. 13 (21): 643–646. Bibcode:1964PhRvL..13..643S. doi:10.1103/physrevlett.13.643. ^ a b Cho, Adrian (2 April 2010). "Mass of the Common Quark Finally Nailed Down". Science. American Association for the Advancement of Science. Retrieved 27 September 2014. ^ Wilczek, F. (2003). "The Origin of Mass" (PDF). MIT Physics Annual: 24–35. Retrieved May 8, 2015. ^ Ji, Xiangdong (1995). "A QCD Analysis of the Mass Structure of the Nucleon". Physical Review Letters. 74 (7): 1071–1074. arXiv:hep-ph/9410274. Bibcode:1995PhRvL..74.1071J. doi:10.1103/PhysRevLett.74.1071. PMID 10058927. ^ Martinelli, G.; Parisi, G.; Petronzio, R.; Rapuano, F. (1982). "The proton and neutron magnetic moments in lattice QCD". Physics Letters B. 116 (6): 434–436. Bibcode:1982PhLB..116..434M. doi:10.1016/0370-2693(82)90162-9. Retrieved May 8, 2015. ^ Kincade, Kathy (2 February 2015). "Pinpointing the magnetic moments of nuclear matter". Phys.org. Retrieved May 8, 2015. ^ a b J. Byrne (2011). Neutrons, Nuclei and Matter: An Exploration of the Physics of Slow Neutrons. Mineola, New York: Dover Publications. pp. 28–31. ISBN 978-0486482385. ^ Hughes, D.J. ; Burgy, M.T. (1949). "Reflection and polarization of neutrons by magnetized mirrors" (PDF). Physical Review. 76 (9): 1413–1414. Bibcode:1949PhRv...76.1413H. doi:10.1103/PhysRev.76.1413. ^ Sherwood, J.E. ; Stephenson, T.E. ; Bernstein, S. (1954). "Stern-Gerlach experiment on polarized neutrons". Physical Review. 96 (6): 1546–1548. Bibcode:1954PhRv...96.1546S. doi:10.1103/PhysRev.96.1546. ^ Miller, G.A. (2007). "Charge Densities of the Neutron and Proton". Physical Review Letters. 99 (11): 112001. arXiv:0705.2409. Bibcode:2007PhRvL..99k2001M. doi:10.1103/PhysRevLett.99.112001. PMID 17930428. ^ "Pear-shaped particles probe big-bang mystery" (Press release). University of Sussex. 20 February 2006. Retrieved 2009-12-14. 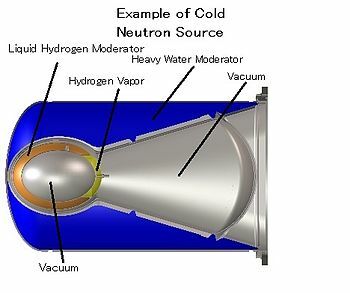 ^ A cryogenic experiment to search for the EDM of the neutron. Hepwww.rl.ac.uk. Retrieved on 2012-08-16. ^ Search for the neutron electric dipole moment: nEDM. Nedm.web.psi.ch (2001-09-12). Retrieved on 2012-08-16. ^ US nEDM ORNL experiment public page. Retrieved on 2017-02-08. ^ SNS Neutron EDM Experiment Archived 2011-02-10 at the Wayback Machine. P25ext.lanl.gov. Retrieved on 2012-08-16. ^ Measurement of the Neutron Electric Dipole Moment. Nrd.pnpi.spb.ru. Retrieved on 2012-08-16. ^ Kisamori, K.; et al. (2016). "Candidate Resonant Tetraneutron State Populated by the He4(He8,Be8) Reaction". Physical Review Letters. 116 (5): 052501. Bibcode:2016PhRvL.116e2501K. doi:10.1103/PhysRevLett.116.052501. PMID 26894705. ^ "Physicists find signs of four-neutron nucleus". 2016-02-24. ^ Orr, Nigel (2016-02-03). "Can Four Neutrons Tango?". Physics. 9. Retrieved 2016-04-11. ^ Spyrou, A.; et al. (2012). "First Observation of Ground State Dineutron Decay: 16Be". Physical Review Letters. 108 (10): 102501. Bibcode:2012PhRvL.108j2501S. doi:10.1103/PhysRevLett.108.102501. PMID 22463404. ^ Llanes-Estrada, Felipe J.; Moreno Navarro, Gaspar (2012). "Cubic neutrons". Modern Physics Letters A. 27 (6): 1250033–1–1250033–7. arXiv:1108.1859. Bibcode:2012MPLA...2750033L. doi:10.1142/S0217732312500332. ^ Knoll, Glenn F. (1979). "Ch. 14". Radiation Detection and Measurement. John Wiley & Sons. ISBN 978-0471495451. ^ Köhn, C.; Ebert, U. (2015). "Calculation of beams of positrons, neutrons and protons associated with terrestrial gamma-ray flashes". Journal of Geophysical Research: Atmospheres. 23 (4): 1620–1635. Bibcode:2015JGRD..120.1620K. doi:10.1002/2014JD022229. ^ Köhn, C.; Diniz, G.; Harakeh, Muhsin (2017). "Production mechanisms of leptons, photons, and hadrons and their possible feedback close to lightning leaders". Journal of Geophysical Research: Atmospheres. 122 (2): 1365–1383. Bibcode:2017JGRD..122.1365K. doi:10.1002/2016JD025445. PMC 5349290. PMID 28357174. ^ Clowdsley, MS; Wilson, JW; Kim, MH; Singleterry, RC; Tripathi, RK; Heinbockel, JH; Badavi, FF; Shinn, JL (2001). "Neutron Environments on the Martian Surface" (PDF). Physica Medica. 17 (Suppl 1): 94–96. PMID 11770546. Archived from the original (PDF) on 2005-02-25. ^ Byrne, J. Neutrons, Nuclei, and Matter, Dover Publications, Mineola, New York, 2011, ISBN 0486482383, pp. 32–33. ^ Science/Nature |Q&A: Nuclear fusion reactor. BBC News (2006-02-06). Retrieved on 2010-12-04. ^ Byrne, J. Neutrons, Nuclei, and Matter, Dover Publications, Mineola, New York, 2011, ISBN 0486482383, p. 453. ^ Kumakhov, M.A. ; Sharov, V.A. (1992). "A neutron lens". Nature. 357 (6377): 390–391. Bibcode:1992Natur.357..390K. doi:10.1038/357390a0. ^ Physorg.com, "New Way of 'Seeing': A 'Neutron Microscope'". Physorg.com (2004-07-30). Retrieved on 2012-08-16. ^ "NASA Develops a Nugget to Search for Life in Space". NASA.gov (2007-11-30). Retrieved on 2012-08-16. ^ Freeman, Tami (May 23, 2008). "Facing up to secondary neutrons". Medical Physics Web. Archived from the original on 2010-12-20. Retrieved 2011-02-08. ^ Heilbronn, L.; Nakamura, T; Iwata, Y; Kurosawa, T; Iwase, H; Townsend, LW (2005). "Expand+Overview of secondary neutron production relevant to shielding in space". Radiation Protection Dosimetry. 116 (1–4): 140–143. doi:10.1093/rpd/nci033. PMID 16604615.